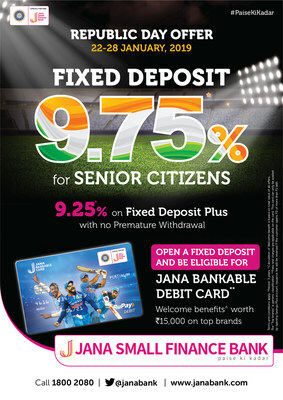 The senior citizens will benefit from high interest rate of 9.75% on the tenure of three years. The bank is also providing Doorstep Account Opening services, so that the customers can open fixed deposits and savings accounts from the comfort of their home and workplace. Besides, it is also offering 9.25% interest rate to all its customers on three-year Fixed Deposit with no premature withdrawal. Jana Small Finance Bank’s vision is to become the leading inclusive digitized bank, serving all customer segments and communities of an aspirational India. The bank is serving 45 lakh customers across 20 states in India. By end of 2019, its 500 microfinance storefronts will be converted into bank branches. By 2020, the bank aspires to add 40 lakh customers. To get additional information on the offer, customers can dial-in toll free number – 18002080. 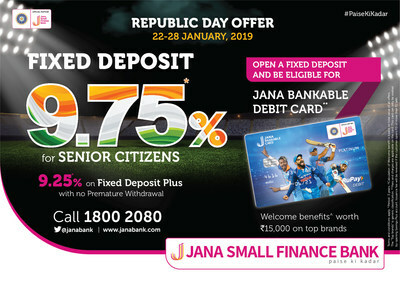 Jana Small Finance Bank received a final banking license in April 2017 and started banking operations on March 28, 2018. Under the leadership of its MD & CEO, Ajay Kanwal, Jana Small Finance Bank’s vision is to become the leading inclusive digitized bank serving all customer segments and communities of an aspirational India. Currently, post-transition phase, the bank is enabling its existing 45 lakh customers across 20 states in India to access the banking services. By 2020, the bank aspires to add four million customers. By end of 2019, Jana Small Finance Bank’s 500 branches will be operational in 20 states, post-conversion of the majority of its microfinance storefronts into bank branches. Bengaluru-headquartered Jana Small Finance Bank is regulated by the Reserve Bank of India (RBI).